With a comfortable 43-17 win over the Bengals on Sunday night, the New England Patriots strongly suggested that rumors of their demise are greatly exaggerated. In beating what had looked like the best team in football by 26 points, Bill Belichick put together a game plan, especially on offense, that attacked Cincinnati’s weaknesses. More than anything, this was a Patriots win in a game that felt like it was far more important to the team on one side of the field. In a normal game, Tom Brady doesn’t try to sneak it in short-yardage on consecutive plays on the opening drive. Rob Gronkowski doesn’t see his snap count nearly double1 if this is a normal game. And the fans in Foxborough, who don’t exactly have a reputation as one of the best home-field crowds in football, don’t get that loud or chant Brady’s name throughout the first quarter if they thought this was just another contest. It’s an overly simplistic and hokey narrative that I would reject out of hand 99 times out of 100, but this was that rare game when it actually felt like the Bengals wanted it but the Patriots needed it. Needing it is one thing, but the Patriots also came up with an excellent plan. Analysts often mistake a commitment to running the football as a cause of winning as opposed to the effect, but here, it was what the Patriots needed to do. Cincinnati came into this game with the league’s worst run defense per DVOA. It had allowed the mundane rushing attacks of Baltimore, Atlanta, and Tennessee to average 5.1 yards per carry during its first three games, but because Cincinnati had spent so much time in those games with a comfortable lead, those opposing teams had to abandon the run and throw the ball to try to catch up. Here, the Patriots ran early and often. After starting with a 20-yard play-action pass to Brandon LaFell, New England ran the ball on seven of its next nine plays (not including a Brady scramble), eventually culminating in a Stevan Ridley touchdown. The Patriots called 20 run plays in the first half against 22 pass plays; by the end of the game, not including Jimmy Garoppolo kneeldowns, they finished with a whopping 43 carries for 224 yards, averaging 5.2 yards per rushing attempt. The Bengals clearly miss departed defensive end Michael Johnson, who was an elite run defender, and the injury to star linebacker Vontaze Burfict (concussion) hasn’t helped. This is going to be a problem for the Bengals in the weeks to come, especially if they can’t get out to an early lead. It’s hard to imagine that stumbling New England offensive line from last week creating holes against anybody, but it clearly had its best performance of the season Sunday night. After constantly shuffling their lineup and benching players against the Chiefs, the Patriots opened the game with former starting center Ryan Wendell in at right guard for the inactive Cameron Fleming, a move that left rookie center Bryan Stork with veteran guards on both sides. That certainly helped, as Stork, Wendell, and left guard Dan Connolly worked well as a unit to create holes at the line of scrimmage. The Patriots didn’t stray from that starting five until late in the game, and while right tackle Sebastian Vollmer blew up a Patriots possession by forgetting the snap count, the line looked like a competent unit for the first time all season. This will almost surely be the unit the Patriots use going forward. Josh McDaniels also gave that line help by going away from New England’s more familiar formations into more traditional, power-oriented sets. The Patriots went with a lone back behind Brady 76 percent of the time last year (per Football Outsiders Almanac 2014), the seventh-highest rate in football. After seeing a mix of that and three-wideout sets over the first few weeks of the season, the Patriots went with a heavier dose of fullback James Develin as a lead blocker for the team’s various running backs. Even more noticeable was how the Patriots went back to their abandoned standby, the two-tight-end set. McDaniels dialed up two or more tight ends on 48 of New England’s 84 offensive snaps, and they delivered. Gronkowski’s snap count spiked, as did the usage rate of Tim Wright, who delivered after four anonymous weeks. After being targeted on just five passes in September, Wright broke out by catching all five of his targets Sunday for 85 yards and a touchdown. 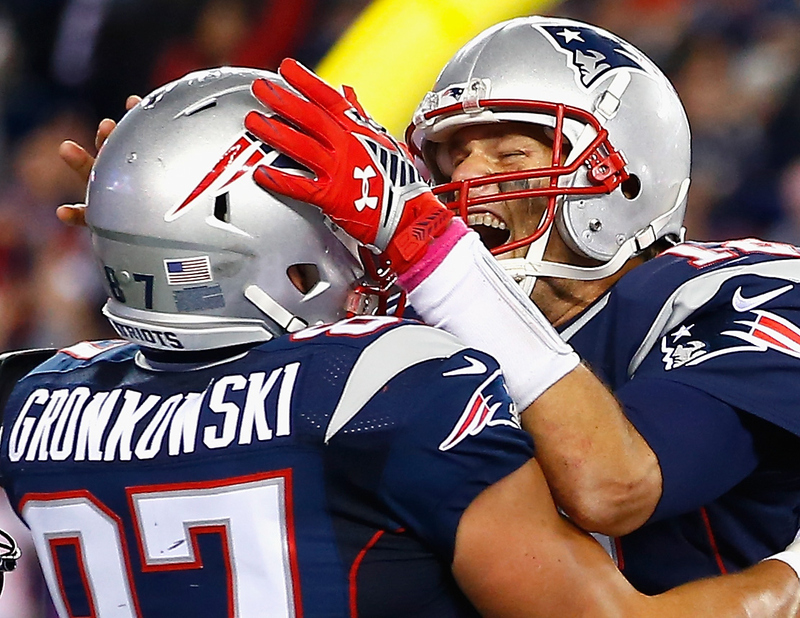 In all, Gronkowski and Wright were targeted on 16 of Brady’s 35 pass attempts, including both of his touchdown passes. Despite pregame reports questioning Brady’s future with the team (more on those in a moment), the revitalized running game and the much-improved offensive line led to the quarterback’s best game of the season. Brady was 23-of-35 for 292 yards, looking comfortable in the pocket as he repeatedly hit his receivers with catchable, well-timed throws. He was even 5-for-8 on passes that traveled 15 yards or more in the air. The Bengals knocked down Brady only once on 38 drop-backs, a sack that came when Robert Geathers beat Gronkowski, and rarely hassled the Patriots star. Brady wasn’t perfect, as he made a subpar throw to take an open Julian Edelman offline as he ran up the seam for what would have been a touchdown, but nobody could credibly make a case that the QB needed to be replaced after this performance. The Patriots also got their best game of the season from their most important player on the other side of the football. Darrelle Revis has been erratic this season, as a great game against the Vikings was followed by lackluster play against the Raiders and Chiefs. More so than any other tilt this year, the Patriots turned Revis loose in man coverage on one player, star Bengals wideout A.J. Green. Revis didn’t have a perfect day, picking up an illegal contact call that nullified an interception and allowing a 35-yard completion to Green on a go route, but he battled Green to a draw, which is more than just about any other cornerback can say. Green’s touchdown catch came immediately after Revis left the field with a minor hamstring injury. It wasn’t exactly Revis Island, but it was the closest the Pats have seen since Revis joined the team. The Bengals didn’t help themselves — they left several big plays on the field early, including a dropped Brady pick and an overthrown wheel route to Gio Bernard that looked like it could have gone for a touchdown. The Patriots repeatedly shot themselves in the foot with penalties, drawing 12 flags for 114 yards and five first downs, including a bizarre unnecessary roughness penalty on rookie Dominique Easley while he blocked on a fumble return that wasn’t even ruled a fumble on the field. And speaking of those fumbles, New England rode its luck by recovering all three fumbles that hit the field Sunday, including a fumbled kickoff by former Patriots draft pick Brandon Tate that was returned for a game-sealing touchdown. In saying all that, it’s really hard to argue with the final score. Beating the last undefeated team in football by 26 points2 should, at the very least, be a sign that it’s too early to count out the Patriots. There will still be major questions to ask of that offensive line in the weeks to come, and Brady still looked bad when the Bengals did occasionally get pressure. But less than a week after we all entertained the notion that the Patriots were toast, they’re back. Brady’s performance behind a competent offensive line against what had been the league’s best pass defense should be enough to convince Patriots fans he wasn’t the problem with the New England offense. Earlier in the day, we saw the first reports begin to leak out suggesting there was serious tension between Brady and the Patriots. Sources on both sides suggested Brady’s performance had slipped and that he could imagine himself finishing his career with another team, thoughts I had yet to see expressed by either party. After Sunday, there’s a good chance that all washes away into the ether. The reason you saw those comments — and the reason you might want to keep them in the back of your mind for the next few months — is that the Patriots are in a very awkward spot with Brady’s contract. The Patriots would be in serious cap trouble if they got rid of Brady after this season. If New England really wanted to move on from its franchise passer, the structure of his contract makes it so the Patriots would need to do it soon. Like before the October 28 trade deadline soon. When Brady signed his most recent contract extension in February 2013, he deliberately took less money than what he would have received on the open market to create additional cap space for the Patriots. A league source told ESPN that Brady did so because “he trusts the Patriots will add the right players to finish his career with the best chance to win another Super Bowl,” which seemed like a cruel joke after that loss to the Chiefs last Monday night. Indeed, sources close to Brady cited his frustration with “questionable personnel decisions” in Chris Mortensen’s piece from Sunday afternoon. Those salaries are guaranteed for injury, so Brady would still get paid if he got hurt. Here’s the big problem for the Patriots. If he’s still on the roster during Week 17 of this season, those salaries become fully guaranteed, adding $24 million to the value of Brady’s contract. When the Patriots agreed to the terms of this deal, they were happy to offer that guarantee because it was unlikely Brady would ever play anywhere else. He’d either play through the end of the contract at a team-friendly rate of $8 million in salary per year or retire, in which case the guaranteed salaries are wiped off the books. If the Patriots wanted to move on from Brady, they would naturally hope he would offer to retire. If he felt like he still had something to offer on another roster, though, it would create a colossal problem for the Patriots. Let’s say the Patriots held on to Brady and then decided to get rid of him, either via release or trade, during the 2015 offseason. The financial implications of such a move would be significant. Brady’s cap hit for 2015 is $13 million. If the Patriots traded Brady, while they wouldn’t owe the future base salaries remaining in Brady’s deal, they would owe the $18 million left from Brady’s prorated signing bonus in 2015. The Patriots could cut Brady and designate him as one of their two post–June 1 releases, which would allow them to push some of the prorated signing bonuses onto their cap the following year, but they would be on the hook for Brady’s future guaranteed base salaries, which would accelerate onto their 2015 cap. They would owe a devastating $30 million in dead money for 2015 and $12 million more in 2016. The following table includes how much Brady would cost the Patriots the next three seasons, based on how and when they could get rid of Brady. The release scenarios are assuming Brady is released as a post–June 1 cut; if not, the financial splits are the same as if he were traded. The years Brady would play for the team (as opposed to representing dead money) are bolded. If Brady is on the roster through the end of 2016, it would cost the Patriots just as much to keep him in 2017 as it would to move on: $15 million. All of this, again, assumes Brady would be leaving the team without retiring. If Brady retires, the Patriots would only be responsible for the prorated signing bonuses remaining on his deal. So if Brady retires after this year, the Patriots would owe $18 million in dead money on their 2015 cap, $5 million more than what they would pay Brady to play. If he retires after next year, the Patriots would owe $12 million. And if he retires after the following year, they would only owe $6 million on their 2017 cap. Now, as I wrote before Sunday night’s blowout win over the Bengals, I don’t think the Patriots should move on from Brady. But if the Patriots think he’s slipped to the point where he’s not an above-average NFL starter and want to eventually move on to Jimmy Garoppolo, they’re either going to be stuck paying starter-caliber money to a backup for the next several seasons or have to hope that Brady will hate sitting on the bench enough to retire. Or there’s one other thing they could do. If the Patriots think Brady’s not in their future and that he won’t retire, they could — and I would never even mention this if New England wasn’t Belichick’s team — trade him before the October 28 trade deadline. It’s the only chance the Patriots will have until 2017 to deal Brady and get serious assets back in return without eating an enormous, franchise-altering cap penalty. If the Patriots traded Brady this month, you have to assume it would basically lay their 2014 season to rest. It would be, however, the cheapest way to move on from Brady. In 2015, they would owe $18 million in prorated bonuses as dead money, but after that, they wouldn’t owe another dime.3 The $18 million is a sunk cost. What an October trade would do is save them $24 million in both real money4 and cap space over the next three seasons while accumulating assets for 2015 and beyond. Could the Patriots find a better use for that $24 million and pick up, say, a first-round pick in the process? Brady would represent an appealing option for a team that thinks he still has a good amount to offer; if somebody traded for Brady this October and kept him through the remainder of 2014,5 they would basically be signing Brady to a three-year, $24 million deal that’s fully guaranteed until Brady retires. The Patriots would still be on the hook for the prorated signing bonus either way. In a market where Kyle Orton makes $11 million over two years, $8 million per year for Brady doesn’t seem too awful. What kind of trade would make sense? A team like St. Louis or Tampa Bay could offer a 2015 first-round pick to solve its quarterback problem. Houston would be the ideal fit, given that Brady already knows Bill O’Brien’s system, but it’s likely to pick later in the first round given its soft schedule, which would make its first-round pick less valuable. The Jets would probably be interested, but I doubt even Belichick would be willing to troll his own fans that much. Of course, I don’t think Brady’s going to be traded. Belichick is smart enough to realize his quarterback isn’t the problem, and it wouldn’t surprise me if Brady had a wink-wink deal with the organization that he would retire before playing anywhere else. Brady’s reputation as a competitor is well-known, and this illustrates how difficult it will be for the Patriots if there comes a point when he’s no longer in their plans as the starting quarterback. At the very least, for the first time in team history, the Patriots were willing to publicly float the idea of letting Brady play elsewhere. That’s something. And if the Pats do think Brady’s days as a starter are numbered, well, this month would be the best time to pull the trigger. If you’re a Lions fan, the win expectancy chart for Sunday’s loss to the Bills might be too painful to read. After Matthew Stafford found Golden Tate for 55 yards to set the Lions up on the Buffalo 34-yard line with 47 seconds left, the Lions had an 89 percent chance of coming away with their fourth victory. Somehow, 38 seconds of game time later, the Lions’ chances of winning were all the way down to 2 percent. One failed fumblerooski later and the Bills were carrying deposed Lions head coach Jim Schwartz on their shoulders as unlikely 17-14 winners. What happened? As seems to be par for the course for the Lions, shocking kicking happened. While the Lions were somehow both overly conservative and too aggressive, with Stafford scrambling once before an incomplete pass and a short pass to Tate for 1 yard, Alex Henery missed a 50-yard field goal wide left that would have likely sealed the game for the Lions. It was Henery’s third miss in three tries, a staggeringly bad performance from a team that has struggled to replace longtime starter Jason Hanson since his 2012 retirement. David Akers hit just 19 of his 24 field goal attempts last year, and somehow, the 2014 Lions have been even worse. How bad? Well, let’s put it into context. Nate Freese, who won the job in training camp, went 3-of-7 before being released. Henery, the former Eagles starter, has started (and ended: Detroit released Henery today) his Lions career by hitting just one of his first five kicks. Somehow, through five weeks, the Lions have gone just 4-of-12 (.333) on field goals. One out of three is great if you’re hitting a baseball or stopping penalty kicks. Kicking field goals in the NFL? Not so much. One of the reasons the Lions have missed those kicks is that they’ve been attempting relatively long field goals. 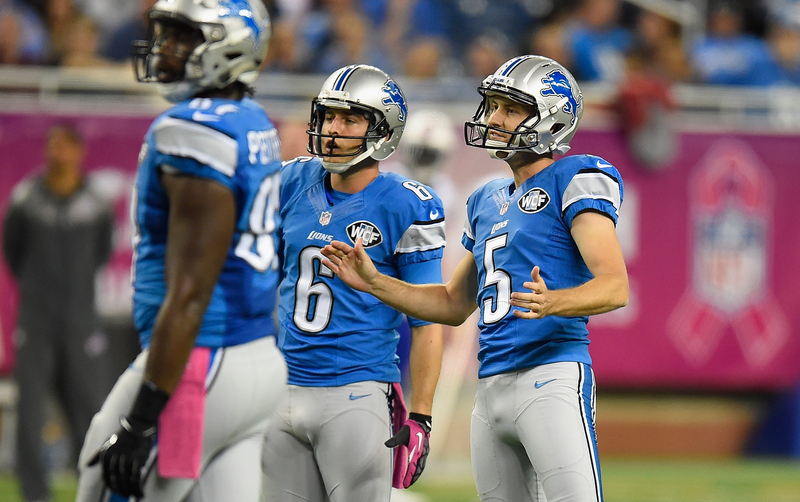 On field goals of 39 yards or less, the Lions are 3-for-3, all kicks from Freese. From 40 or more yards, Detroit’s somehow just 1-for-9. Those kicks are harder, but they’re far from impossible: The rest of the league is 94-of-117 on field goals of 40 yards or more. Using the historical rate6 at which NFL kickers have made those 40-plus-yard field goals, we can estimate how unlikely Detroit’s terrible performance has been. Again, this might not be pleasant for Lions fans. The chances a typical NFL kicker would make no more than one of the nine longer kicks the Lions have attempted this year? About seven in 10,000. This happens less than 0.1 percent of the time. As those long odds suggest, it’s close to impossible to find a recent team that suffered from such significant agony on field goals over a five-week stretch. Going back to 2000, I can’t find a team that either made fewer than one-third of its field goal attempts or missed more than eight field goals over a five-week span. The most recent team to fail this miserably during a five-week stretch is the 2009 Dallas Cowboys, who had Nick Folk go 3-for-9 during a five-game stretch, leading to his release before the playoffs. Bringing up Folk in that discussion is a reminder of how random field goal kicking can be, and how there’s really nothing the Lions could have done to prevent this from happening. Folk was a sixth-round pick who made the Pro Bowl as a rookie with the Cowboys and posted one more above-average season before being released during his disastrous 2009 campaign. The Jets picked him up the following year and he was mediocre, hitting 76.9 percent of his attempts over the next three years, before going 33-of-36 (91.7 percent) in 2013 and starting 2014 on an 8-for-8 clip. Folk was great, and then he totally lost it and had to be replaced, and then he was OK, and then he was great again. It’s hard to judge any kicker based on what he does in a small sample. Take Freese, who went 3-for-7 before being cut. NFL kickers hit 86.5 percent of their field goals last year. The odds that an “average” kicker would miss four or more tries in seven field goals are 121-to-1; that’s high, but not so high that it couldn’t happen by sheer chance over the course of a career. Henery, for what it’s worth, hit on 86 percent of his chances over his three years in Philadelphia and went 1-for-5 these past two weeks. Imagine judging a hitter based on his batting average over a six-game stretch or an NBA player based on his shooting percentage after two games. That’s about what we do when we judge a kicker, who gets 35 chances7 to test his mettle across an entire 16-game season. Lions fans called for Henery’s head after his 1-for-5 start, but unless the former Philly kicker was hiding some sort of leg injury, there’s little reason to think he would have been any better or worse than the kicker the Lions will sign to replace him. Matt Prater has been a popular request on Twitter, given his recent release and success on long field goals, but that’s likely a product of the time he spent in Denver, where the thin air makes kicking a much friendlier exercise. Prater also hit just 81.6 percent of his field goals during his eight-year career, well below Henery’s career rate. Whomever the Lions have kicking for them during the rest of the season — Prater, Jay Feely, or even a 44-year-old lured-out-of-retirement Hanson — is going to do better than the Lions have over the first five weeks. It’s impossible for a team to be this bad at field goals for this long. That’ll help, but regression toward the mean won’t be able to go back in time and erase Detroit’s two losses. Detroit almost surely would have beat Buffalo with better kicking. The case isn’t quite as clear from the Week 2 loss against Carolina, but those two field goal misses came during the first half, when the Lions were outplaying the Panthers. If Detroit makes those two field goals, it heads into halftime tied 6-6, goes up 13-6 just after halftime on their lone touchdown of the day, and changes the complexion of the game. In any case, after seeing their playoff hopes disappear on a 61-yard field goal from Justin Tucker late in the 2013 season, it has to be tough for the Lions to both struggle mightily on field goals and lose to a 58-yarder from Dan Carpenter. At 3-2 and with one of the league’s best defenses, the Lions have a lot to look forward to.8 Given how erratic the NFC North has been over the first five weeks, though, the Lions may very well look back and rue their missed opportunities. One of Sunday’s dumbest plays came as far underneath the radar as possible. The Jacksonville Jaguars delivered a game effort, producing their best defensive performance of the season, but after Pittsburgh’s LeGarrette Blount plunged through the line for a third-and-1 conversion with 2:19 left, the Jaguars were done. The clock wound afterward to the two-minute warning, and with the Jaguars out of timeouts, they appeared resigned to a 17-9 defeat. The Steelers only needed to kneel three times to run out the remaining 120 seconds and claim their third win. That’s not what the Steelers did, though. They came out after the two-minute warning and, of all things, threw a pass. 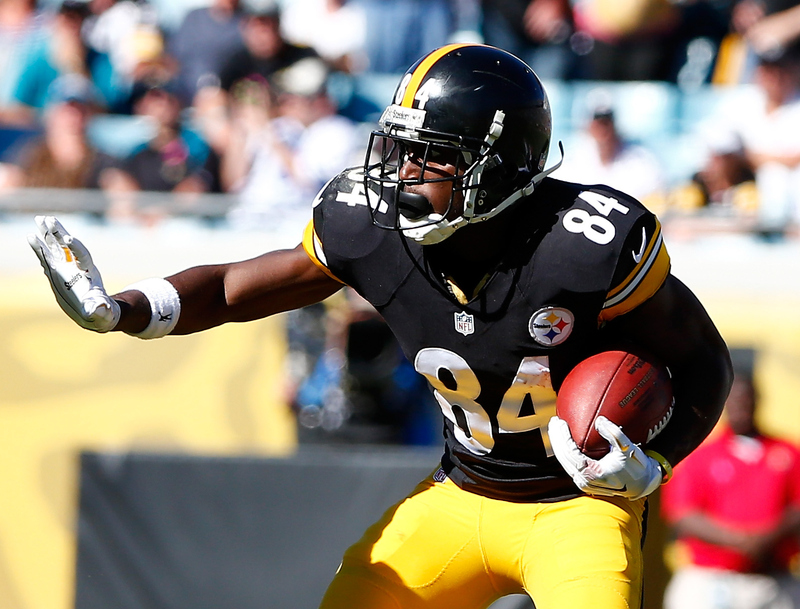 Ben Roethlisberger completed a simple screen to Antonio Brown for 16 yards. Why throw the ball with the game sealed up? Stats! Brown entered the contest with five receptions or more in a league-record 20 consecutive games, but after Blount’s plunge, the star Pittsburgh wideout had just four catches for 68 yards, which would have snapped his streak. Roethlisberger admitted afterward that he called for the play to try to get Brown his streak-extending reception. Streaks are cool. Records are cool. And Brown’s an excellent receiver, a superstar who probably doesn’t get his due as one of the best wideouts in football. But this was an impossibly shortsighted move. The Jaguars were still within one touchdown; if the pass went backward, or if Brown fumbled, the Jaguars could very well have taken the ball over with 1:50 to go and a chance to tie the game. If that happens, the entire world is excoriating Roethlisberger and the Steelers for being greedy enough to sacrifice their hold on the game for chasing a dumb stat, a record nobody will remember two weeks after Brown’s streak eventually ends. It didn’t come back to haunt the Steelers, but that’s not the point; the decision was dumb, regardless of how the process played out. Steelers coach Mike Tomlin is one of the many coaches who have said “stats are for losers.” If that aphorism is true, what were the Steelers doing on that final drive? This article has been updated to reflect the news of Alex Henery’s release. With 68 offensive snaps, up from an average of just under 36 through the first four weeks. If the Patriots didn’t trade Brady but then chose to cut him before Week 17 for some reason, they would owe the same $18 million on their cap for next year. Of course, they also wouldn’t be able to get assets in return. An NFL executive with knowledge of Brady’s contract confirmed to Grantland that the contract has no offset language, meaning the Patriots would be forced to pay Brady the full $24 million listed, even if he signed elsewhere. The same lack of offset language is how Jake Delhomme ended up making $20 million from the Panthers and Browns during his final season in the NFL. A team could theoretically trade for Brady and, if they found him lacking, cut him before Week 17 without owing anything in future salaries. This is a simplified version of the model our colleagues at FiveThirtyEight put together in writing about Rob Bironas. Given that eight of the 12 kicks have come at home in the domed environment of Detroit and that we’re comparing these kicks to the average NFL environment, the numbers here are a conservative estimate if anything. Obviously, kickers also get extra points and kickoffs, but I’m talking about field goal accuracy here. Assuming that Calvin Johnson’s reaggravated ankle injury isn’t a long-term problem, of course. What Can the Triangle Offense Do for Carmelo Anthony?